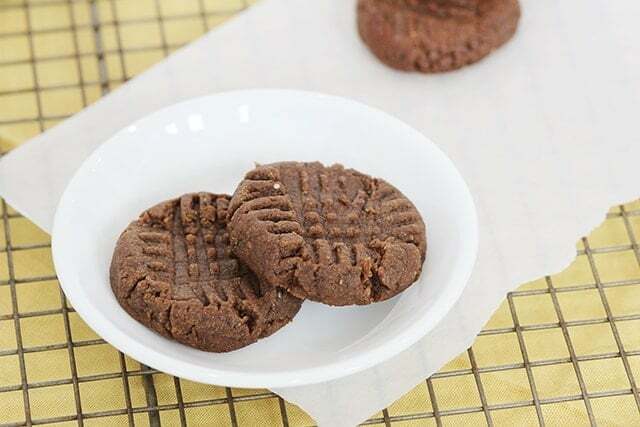 With just a few simple ingredients like chocolate, peanut butter, and chia seeds, you can make these delicious and healthy Chocolate Chia Cookies! Chia seeds are an incredible super food loaded with nutrients and antioxidants. But so many people say that they don’t like the texture of chia seeds when they add them to chia puddings or chia smoothies. Chia seeds turn gelatinous, and the texture is a bit off-putting. 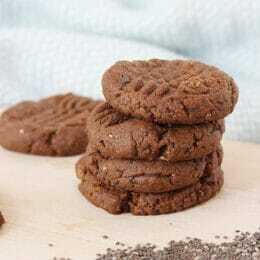 This recipe for chocolate chia cookies however, is the perfect solution! The chia seeds in this recipe stay nice and crunchy instead! 5 grams of fiber (per tablespoon!) This is great for getting kids their daily fiber requirements! Fiber is necessary for kids to have optimal digestion and regular bowel movements. These cookies can help them get there. 3 grams of protein. Chia seeds contain 14% protein which is vital for growing kids. Protein is the building block and repair for muscle and tissue development. 2282 mg of Omega 3 – Healthy fats are necessary for cell strength and brain development. Omega 3 is one of the harder fats to get enough of, since some of the best sources, like fish, aren’t part of many kids diets. Chia seeds are a great way to get this good fat. These nutrients make them a really great source of fiber, protein, and fat. Having all three makes chia seeds an ingredient that can keep kids full longer, and keep blood sugar regular. 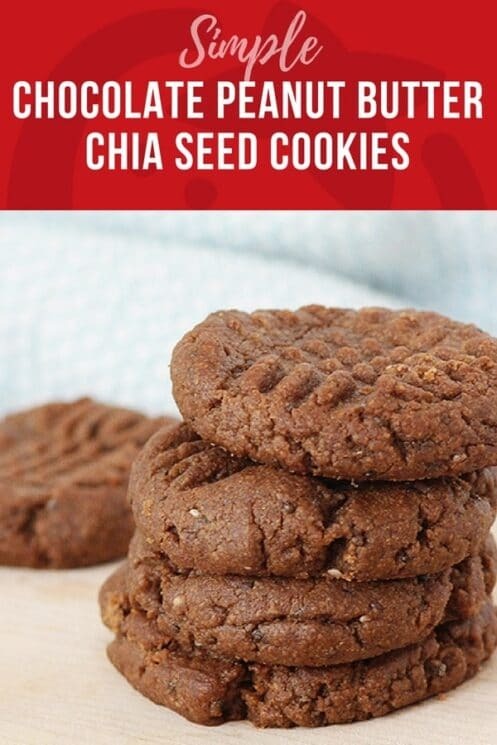 While we have so many recipes using chia seeds on this blog, these chocolate chia cookie are simple, and kids love them. They are even gluten free! The peanut butter and chia seeds combined are a great source of protein and fiber, helping to curb your kids’ sugar cravings and keep them full until dinnertime. And they only take 10 minutes to bake! These chocolate chia cookies are a great way to introduce your kids to a new food, in a new way. As you know, our motto is to serve kids a variety of healthy foods in a variety of ways! Roll the cookie dough into approximately 16 1-inch balls and place on the cookie sheet. Dip fork into a small amount of cocoa powder and flatten with a fork, dipping fork into cocoa powder after each cookie is flattened. Bake for 10 minutes or until the edges are just starting to crisp. I used almond butter and followed the recipe exactly. These came out tasty, but fell apart and a little dry. What did i do wrong? Was your almond butter oily? Perhaps mix the surface oil thru before using next time or else add small amount of butter? Having said that I haven’t tried this recipe yet, but I am an almond butter user. 4 with an optional ingredient for #5! what are the nutrition facts and serving size? Wow, protein and fiber in a cookie. I’ll be making these for me and my grandkids soon! Thanks for the recipe. Will yhis work with ground chia seed? Can these cookies be frozen? If they can, would you freeze them already baked or the raw dough? I made these today using the all Natural PB from Costco. The texture is fine- kind of crumbly even once cooled, but they were not at all sweet. Might depend on the PB used, but i think it needs more sweetener to be called a cookie. My family did not care for them as the recipe is written. These looks delicious, and I’m absolutely going to try them. My only questions is, that as far as I know, super foods like Chia will not keep their healthy proprieties once they are heated. Is it a fact or a fiction? Thanks! We left these in the oven for more than double the recommended time before they were firm enough to lift without crumbling. I used sunbutter in place of almond butter. I have to be honest, these were the weirdest cookies I’ve ever made. They never did brown on the edges, even after I left them in for a few minutes longer. They were extremely soft, but stayed in tact. Biting into them, they seemed to melt in your mouth, but then turned into an unpleasant, almost sandy texture. My main problem was trying to swallow this, not because it tasted bad, but because I was almost afraid of choking. I would not recommend these for kids or elderly adults, that’s for sure. I’m assuming the chia seeds made things just way too thick. I tried refrigerating my cookies to see if anything changed, but sadly it did not. Ended up throwing them away instead of giving them to my kids. Is it possible that there’s a typo in your recipe and it should read 1 tsp of chia seeds?! Thanks anyway, for the recipe. What is the serving size for this cookie recipe? Hi Tammie! This recipe yields about 12 cookies. Thanks for your question! Super easy recipe, made in no time with easy clean up. The cookies didn’t turn out as sweet as I would like. This may be because I used all natural peanut butter. If I make again I will add more maple syrup or some granulated sugar. 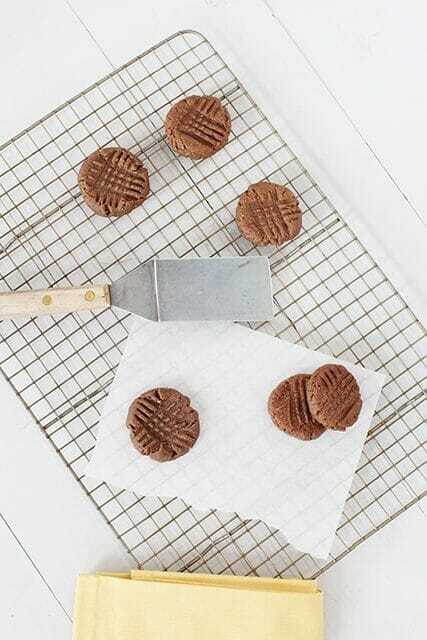 I made these exactly as instructed, using Kirkland brand natural peanut butter, and they were far too dry and crumbly for the kids and I to eat. The peanut butter was properly mixed. Are they supposed to turn out that way? I baked with natural PB a lot and have never encountered this problem! These turned out “OK” but not sure I would make them again. I substituted flax for the egg and almond butter instead of peanut butter. They weren’t necessarily dry but they were crumbly. I made these cookies this morning for my kids, 2 out of 3 kids like them. I’d probably make them again. I didn’t have maple syrup so I just added a tablespoon of honey. I cooked them for 13 minutes and they came out soft and moist. Dry and not sweet at all. Salvaged them by putting frosting on them, which kind of defeated the purpose of a healthy cookie. Won’t make again. These were delicious! Not dry at all, and great flavor. Loved the crunch from the chia seeds. Kid and hubby approved. Made a batch for school lunches. Pretty sure I’ll have to make another batch in a couple days. Also, I must have made mine a bit smaller- I got about 24 cookies out of the batch. Made these for my daughters friends…pre-teens. They liked them, 2 said there was too much peanut butter. I may reduce it next time.